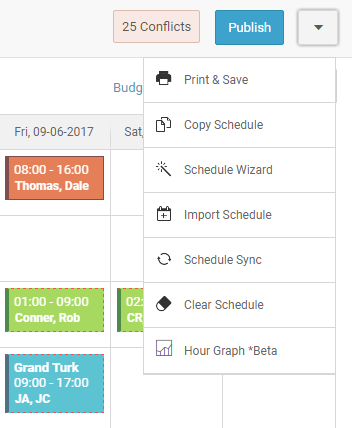 The Schedule Wizard builds on the feature of copying one past section of the schedule, whether a day, week or month, to a future date. In essence, the past schedule can be used as a template to copy shifts into a future date which then can be adjusted as required. 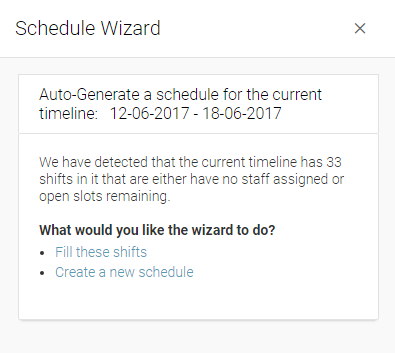 The Schedule Wizard takes this one step further and allows you to Randomize staff assignments orReplace all staff with new assignments based on their Availability and if they are assigned to work that Position. Go to the tab ShiftPlanning and navigate to the date range and the Schedule View which you would like to fill with employees. 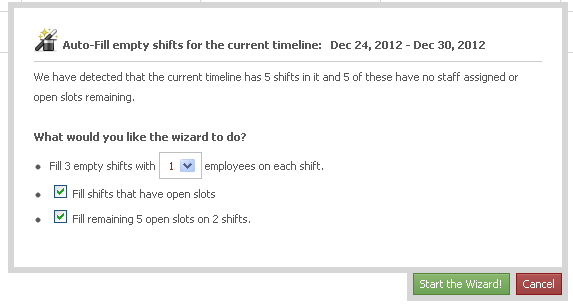 In the below case we already have the shifts created and just want to automatically assign the employees to shifts. Click the downward arrow icon beside Publish button and click on Schedule Wizard. 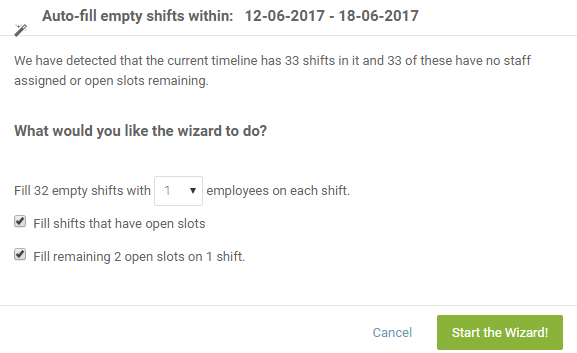 The wizard will automatically detect the empty or open unfilled shifts. If you want to fill empty shifts (shifts that are neither assigned to employees nor open shifts) only and none of the open slots, uncheck the Fill shifts that have open slots option. 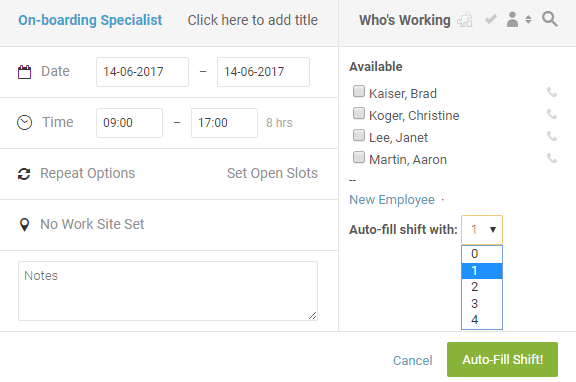 If you want to fill the empty shifts with X number of employees and fill all available open slots, check theFill shifts that have open slots option and the Fill remaining X open slots on X shifts option. If you select the Create a new schedule option you will see this screen. Select the appropriate one and click Start the Wizard. The Schedule Wizard will show any unavoidable conflicts and we recommend that you review and resolve as many as possible before publishing by clicking Resolve Conflicts. You also have the ability to auto fill a specific shift. Click on the option ‘Auto-fill shift’ at the right bottom corner of the shift management screen. 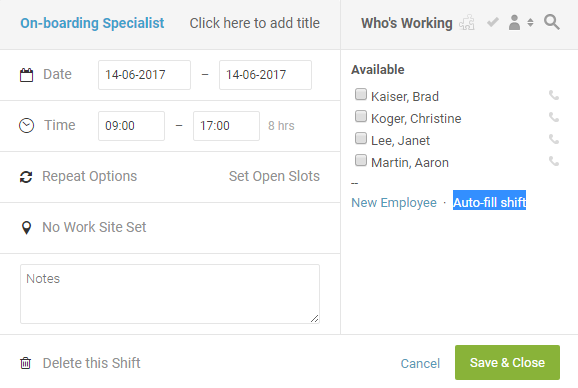 Select the number of employees you want to fill the shift with and click Auto-Fill Shift.